The hosts led by Alastair Cook, won two out of their three encounters and beat South Africa convincingly in the semi-final. The team has shown an all-round performance in all three matches they have won so far. The home batsmen have provided a solid base for their bowlers while batting first and made things look easy while chasing the target. The bowlers have come up to the required expectations and did not let their side down in the games played so far. Below, we will highlight the performance of England on their way to the final of the tournament. 1- Vs. Australia at Edgbaston, Birmingham, on June 8, 2013. England – 6-269, Ian Bell 91 (115b 7×4), Ravi Bopara 46* (37b 3×4 1×6), Jonathan Trott 43 (56b 1×4), Clint McKay 2-38, James Faulkner 2-48. Australia – 9-221, George Bailey 55(69b 2×4), James Faulkner 54 (42b 5×4 1×6), Phillip Hughes 30 (55b 3×4), James Anderson 3-30, Tim Bresnan 2-45. Result – England won by 48 runs. 2- Vs. Sri Lanka at Kennington Oval, on June 13, 2013. England – 7-293, Jonathan Trott 76 (87b 5×4), Joe Root 68 (55b 5×4), Alastair Cook 59 (85b 3×4), Rangana Herath 2-46, Lasith Malinga 2-58. Sri Lanka – 3-297, Kumar Sangakkara 134*(135b 12×4), Nuwan Kulasekara 58* (38b 5×4 3×6), Tillakaratne Dilshan 44 (56b 3×4 1×6), James Anderson 2-51, Graeme Swann 1-50. 3- Vs. New Zealand at Sophia Gardens, Cardiff, on June 16, 2013. Result – England won by 10 runs. Semi-final vs. South Africa at Kennington Oval, on June 19, 2013. South Africa – 175 all out in 38.4 overs, David Miller 56* (51b 5×4 2×6), Rory Klienveldt 43 (61b 4×4 1×6), Robin Peterson 30 (41b 4×4), James Tredwell 3-19, Stuart Broad 3-50. England – 3-179 in 37.3 overs, Jonathan Trott 82* (84b 11×4), Joe Root 48 (71b 7×4), Ian Bell 20 (30b 2×4), Rory Klienveldt 1-10, Jean-Paul-Duminy 1-27. 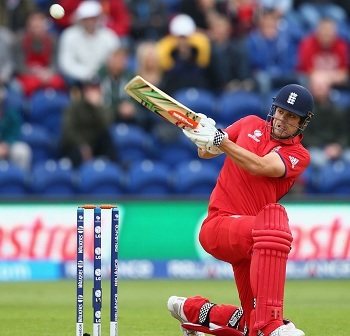 Result – England won by seven wickets. The English team is a charged up unit and will try to continue with their present form in the final to enable themselves to win the ICC Champions Trophy for the first time. The final of the event will be held on June 23, 2013, at Edgbaston, Birmingham, and the second finalist will be decided after the semi-final between India and Sri Lanka on June 20, 2013, at Sophia Gardens, Cardiff.